The Dollmaker’s Workshop is a small business in Metrobay, near the University, owned by the brilliant and eccentric Gilbert E. Petto. The store was quite successful during its early years and is known for its one-of-a-kind, hand-crafted toys and dolls. However, over the years the store saw a sharp decline in sales and popularity as children moved on to name-brand toys and video games, leaving his once thriving shop a charming relic of the past. Even the loyal customers who once frequented his store now order their goods online, leaving Gilbert often alone in his small store. 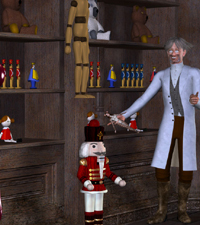 Still, Gilbert continues to run the store and has recently put his brains to good use to catch up to the times, developing new and unique dolls he is sure will restore his once thriving store back to its rightful state of recognition and appreciation.